The smallest, most portable and least expensive way to enjoy the TrueStrike experience. The "fairway forgiveness" effect produced by TrueStrike golf mats means that the shock and the vibration associated with hitting from ordinary mats is substantially reduced. With TrueStrike your customer's play with the confidence of knowing they will be protecting themselves from future problems and avoidingthe aggravation of existing injuries. Can TrueStrikebe used by left and right handers alike? 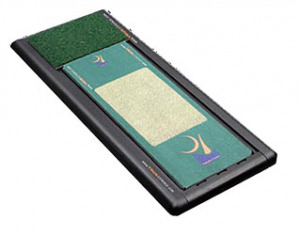 If you have any questions regarding the TrueStrike Portable Golf Mat, please give us a call, we would be happy to help you with any questions you may have. Write an online review on the TrueStrike Portable Golf Mat, and share your thoughts with others.